Situated along the shorelines of Camargue, the Parc Naturel Régional de Camargue is one of the most protected areas covering 820 sq.kms. Designated in 1970, it is located on the Mediterranean, in the Rhone delta, mainly between the two branches of the river and stretches over Arles, Port-Saint-Louis-du-Rhône and the town of Saintes-Maries-de-la-Mer. Green, beautiful and a home to over 120 species of birds, the Nature Park is a good starting point for reconnecting with nature. A ranch where friendly Gardians, pretty much like cowboys, will tell you all about the Carmague cattle and show you their prized bulls along with a manade of Carmague horses. A roadside museum is situated at the old barnhouse Rousty Bridge of Carmague which gives a background the flora and fauna in a very fun and interactive way. The museum stresses upon exhibiting the relationship of man with nature specific to the delta. A territorial observatory with an aim to monitor the ecological, economic and social evolution of the territory in time. The Camargue National Park is a UNESCO World Heritage Site. The museum has an entry ticket of €5. Free entry for children in the museum. 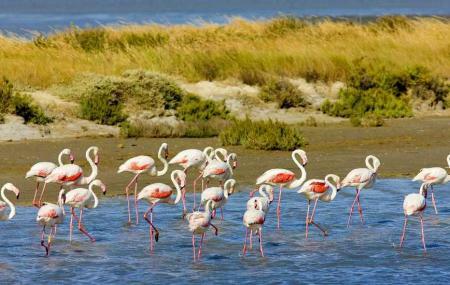 How popular is Camargue Nature Park? People normally club together Les Alyscamps and Espace Van Gogh while planning their visit to Camargue Nature Park. I am lucky enough to work amongst the wilderness of this amazing regional Park and spend my working hours surrounded by flamingoes, waterbirds, lagoons and salt marshes (and, well, sometimes mosquitoes). But I wouldn't trade it for an office job ever! If you love nature and bird watching, this is certainly a place you need to visit! Too many cars all over. No many hides for birdwatching, many tourist for bars, restaurants and entertainment in general. Good proposals fir horse riding but few and disappointing walking itineraries. Not indicated for birdwatchers. One of the most amazing places I've ever been to! We rented a car a just drove around the paths in the park. It was amazing to see the wild horses. The abundance of fauna and flora is breathtaking! An amazing area of natural beauty. Best visited in the spring and outside the mosquito season. Perfect!! For an escape in the wild in Camargue. Hire some horses for 3 hours and have a super day, crossing the swamps, run full throtle on the beach for miles.